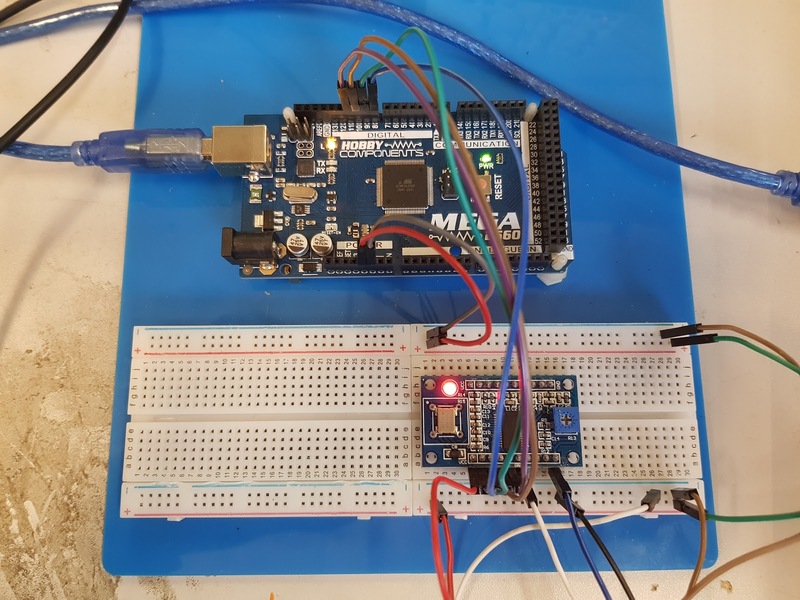 Recently I was asked to provide a bit of assistance with some VHDL code - One of the blog readers was looking to implement a logic based CPU on the Mimas V2 Development board. 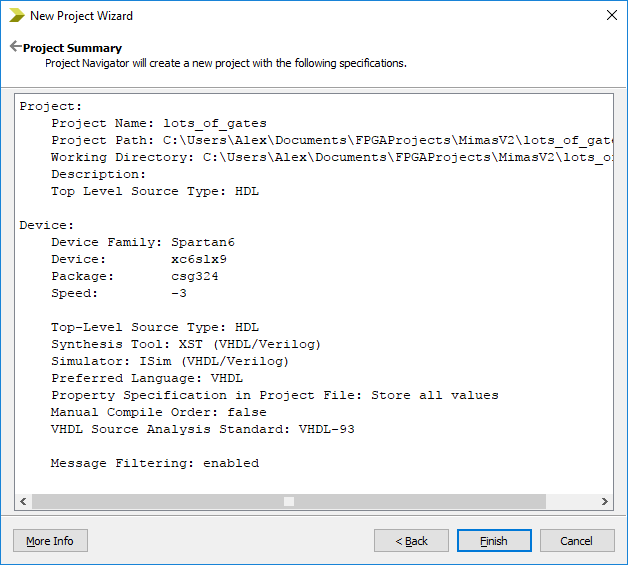 I don't claim to be an expert in VHDL but the crux of his issue was using pre-written code in one project several times. 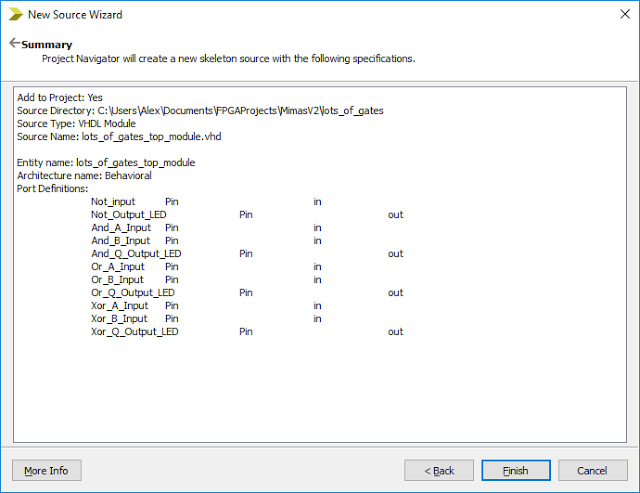 The beauty of FPGA technology is that as long as there is space within the device and pins available it is possible to have as many logic functions as one wants! 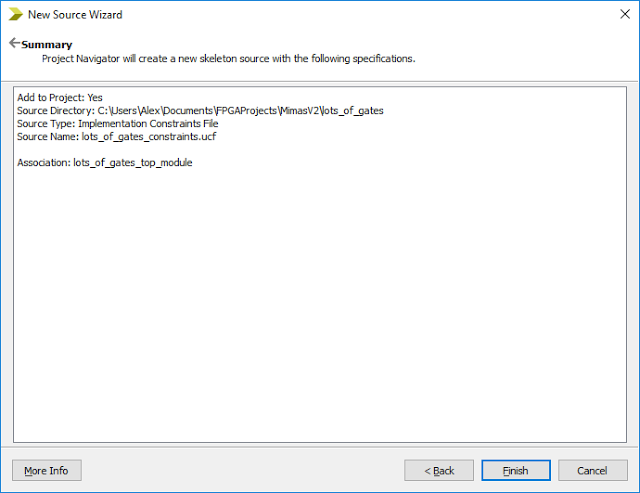 There comes a point in FPGA programming where trying to put all of the code in one single source file becomes really awkward. The file would become very long to read and debug and it may make more sense to take a modular approach and re-use code from previous designs. 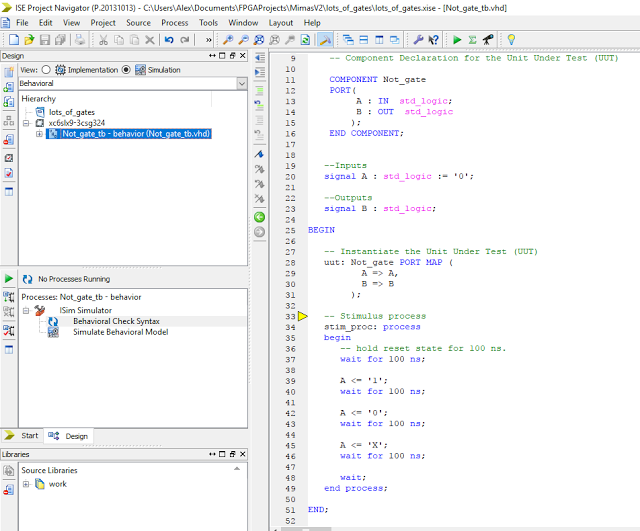 Luckily for the FPGA design engineer it is possible to write and design modules in VHDL very easily and each module can be tested and used on it's own. 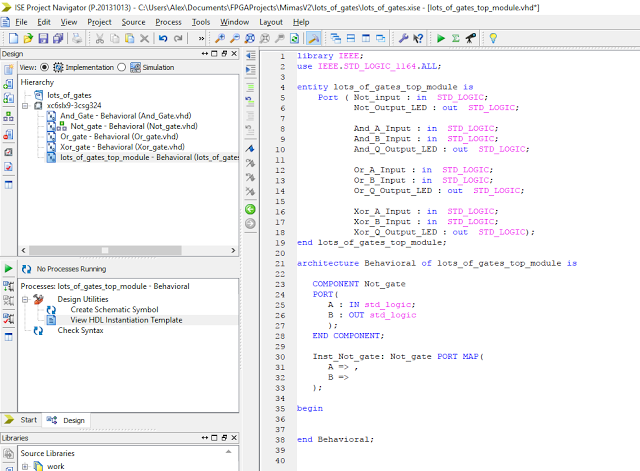 The way to implement this is to use the component keyword in VHDL and 'instantiate' as many of the modules or blocks of code as one wants. 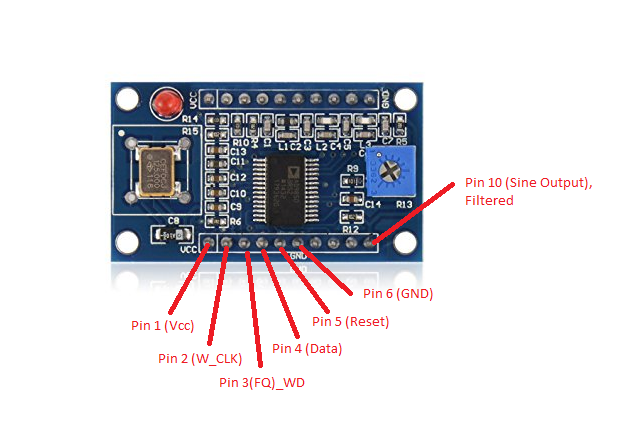 Entities - The statement which defines the external input and output connections of the module. Architectures - This is the code section which actually tells or defines the function of the module. 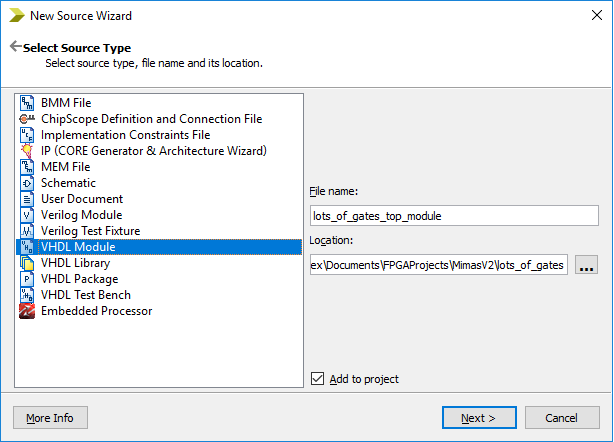 Components - A statement within the architecture section which allows the designer to link internal signals or external signals with pre-written VHDL code in another module. 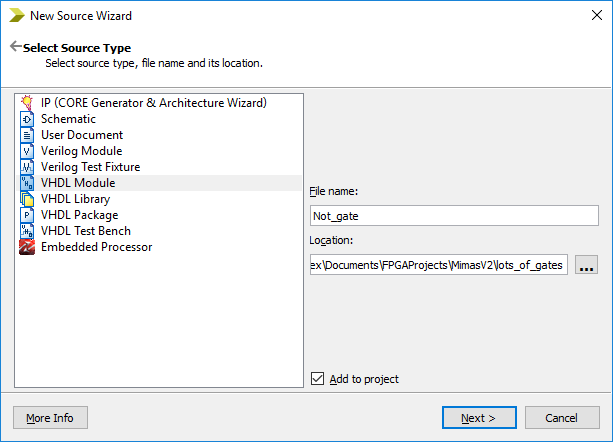 Instances - A statement which actually creates the 'instance' of the external module code within another module. A designer can have multiple instances of a module within a design with one component statement as long as all of the connections are correctly port mapped. You can have as many inputs and outputs as you like and there can be combined inputs and outputs. The green text are keywords and cannot be used as labels. 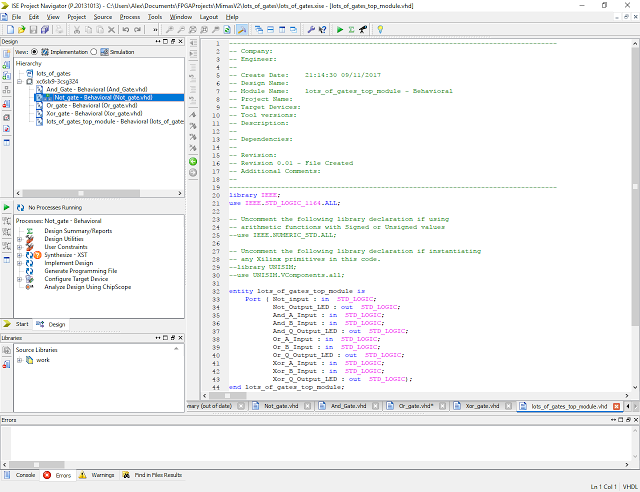 The red text are labels which are used to remind the designer what the entity's purpose is. 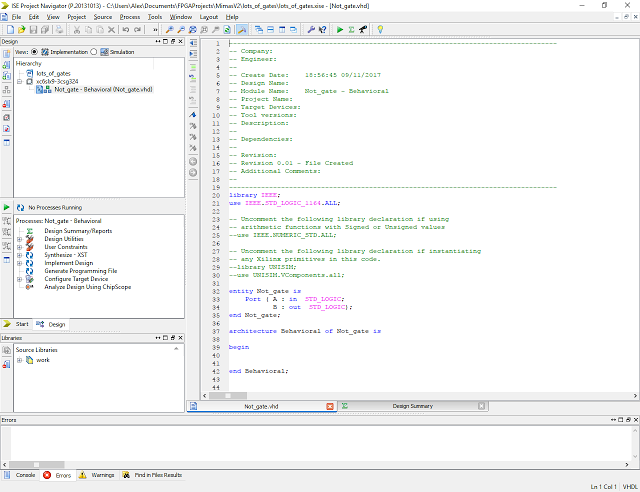 The black text are the defined inputs and outputs. 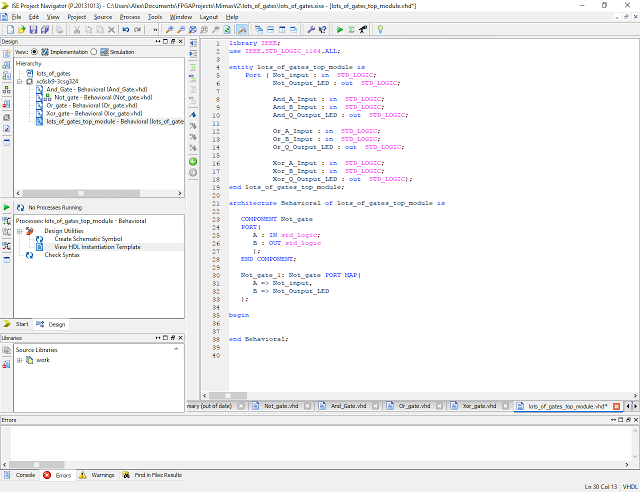 The blue text are the type of inputs and outputs. 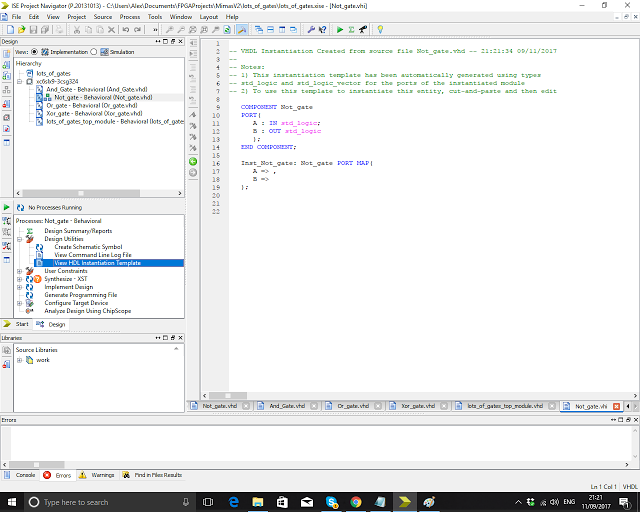 This is the section of code that defines how the internal signals and external signals will interact to realise the function required. 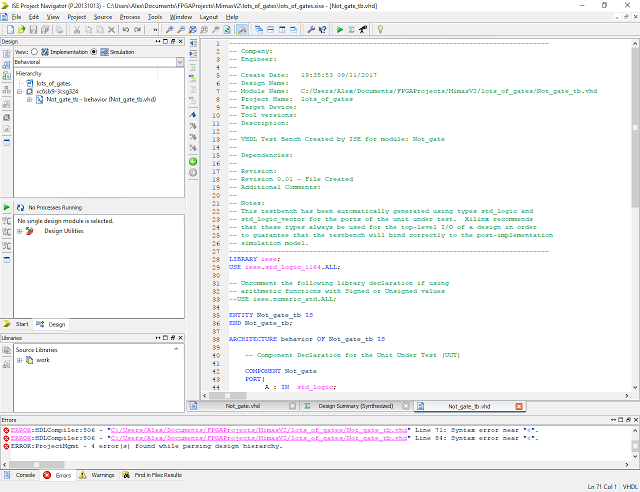 As before the green text are keywords, the red text are labels and the black text are the inputs and outputs. As above, the different colours relate to keywords, labels, definitions and types. 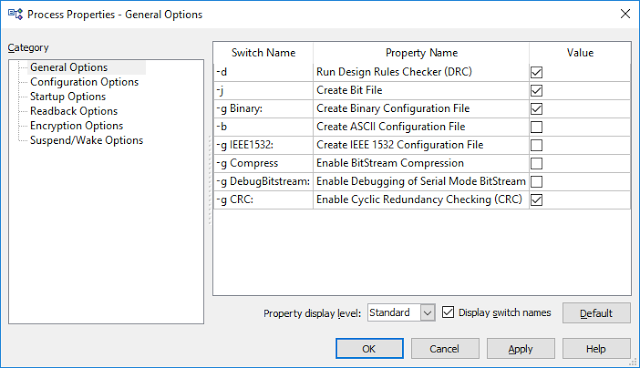 The instantiation code is the way the designer defines how the signals from the component module connect to the signals within the source module. 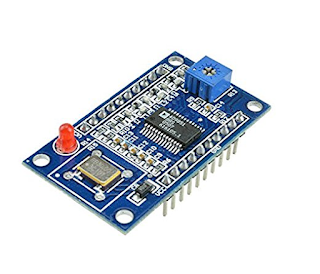 These signals in the source module could be internal or external signals. 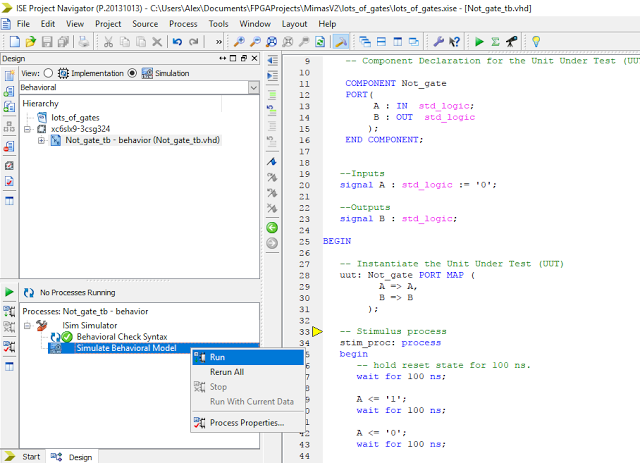 As an example lets write some simple two input logic gates in VHDL code and then'instantiate multiple versions of them in VHDL and then simulate their function and then finally show the results working on the Mimas V2 FPGA Development board. 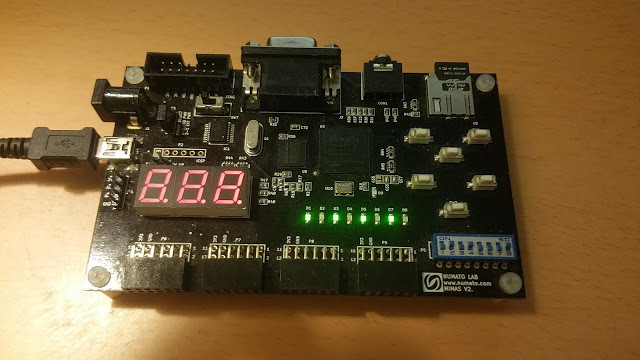 In theory any FPGA development board could be made to work including the Elbert V2 (I will share the Elbert V2 version also as I know some people are using those boards). 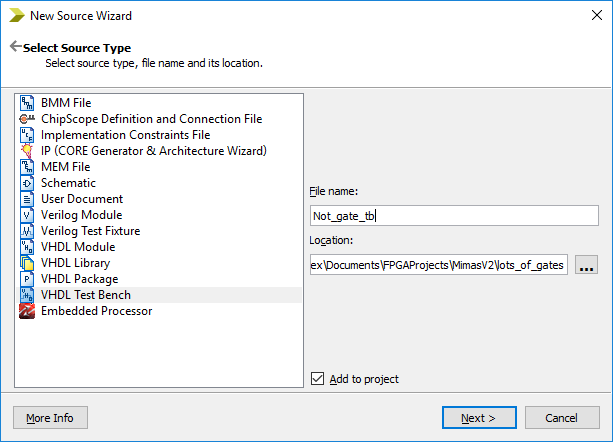 Load up Xilinx WebISE and start a new project - I called mine Lots of gates and placed it in a suitable folder on the hard disk. Input the settings shown (These are correct for the Numato Labs Mimas V2 development board). 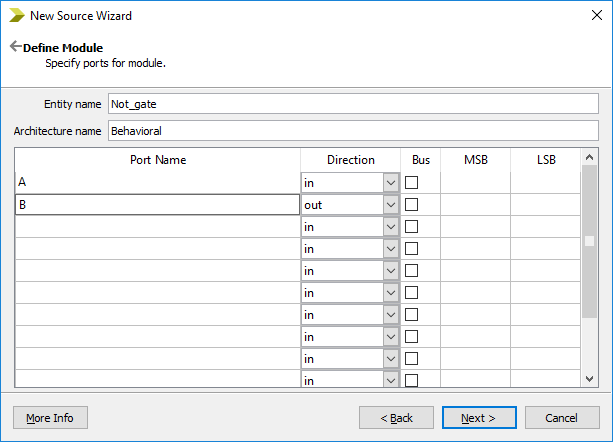 Click Next when ready to continue and enter the inputs and outputs for the Not_gate module. I chose to have an input and an output - to create a single inverter. Now let’s simulate the code we have just written to ensure it works properly before we use it. It's always a good idea to simulate things to make sure that it works as intended. The code generated actually uses the component statement so our automatically generated code is a perfect example of how a statement should be used! 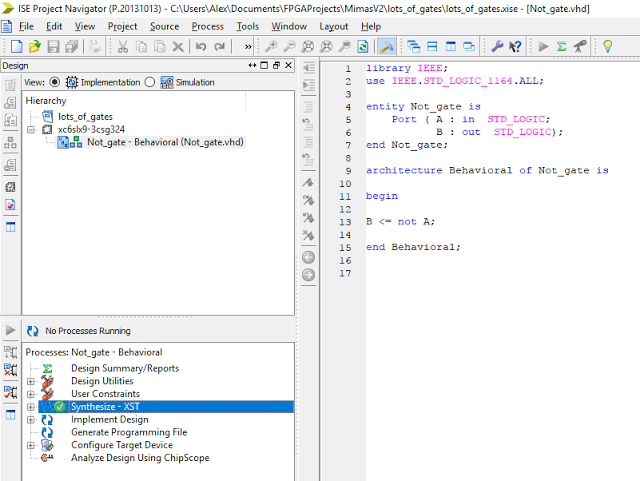 In the architecture statement we can see the component declaration for the Not_gate. 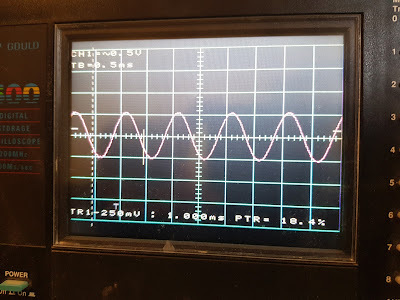 Below that section some internal signals are defined to connect to the component we would like to simulate. 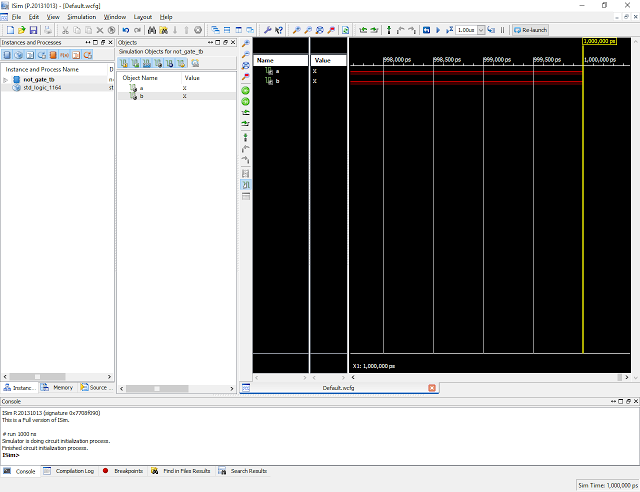 Underneath that section we have the instantiation section which creates a version of the not_gate called 'uut' and maps the internal signal connections to the component signal connections. 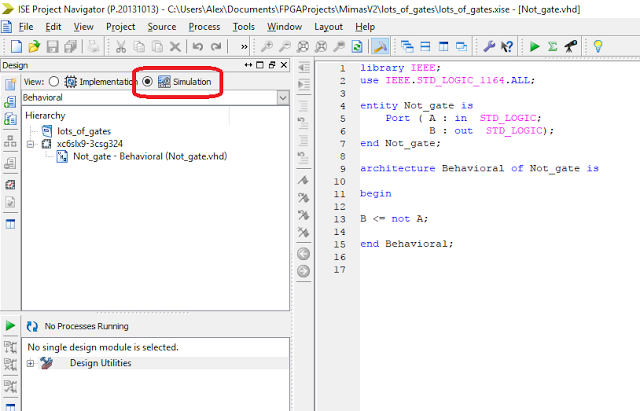 Now we need to write some code in the stimulus process section which sets the A input signal to a known value so that the simulator can run the code in the Not_gate module and display what will happen at the output signal - B. As the module is an inverter or not gate it should be obvious that whatever logic level is present at the output signal is the opposite or inverse of the input signal. For more complicated modules this might be more difficult to assess which is why simulation is useful. It is also possible to see if there are any timing or sequencing issues present with more complicated modules. 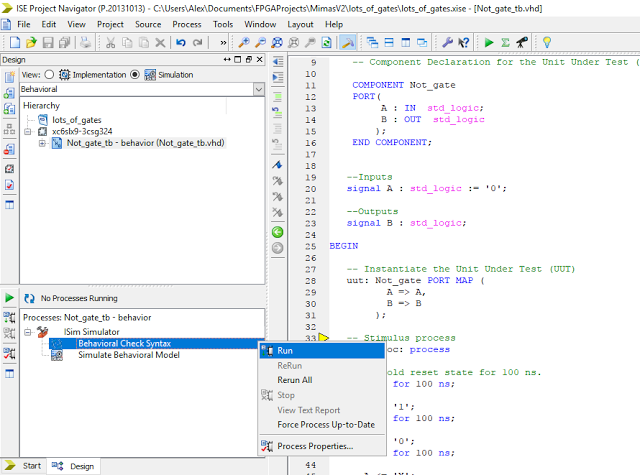 Simulation can be a very useful diagnostic tool when developing FPGA code. 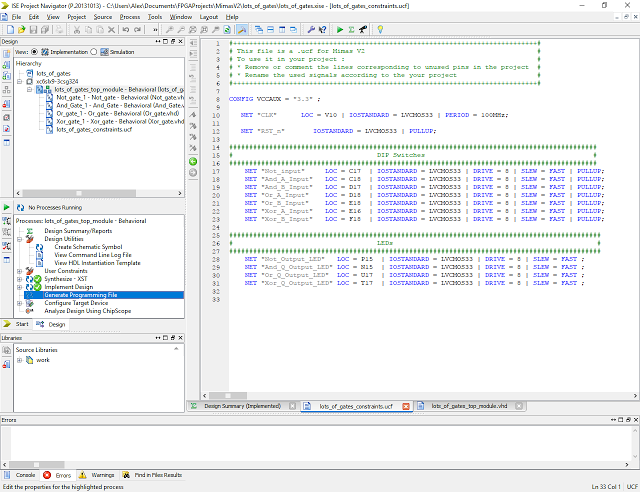 Let’s write the stimulus VHDL code to test the module code and provide the simulator some information. Let’s set the 'A' input of the inverter to logic '1' for 100 ns and then set it to logic '0' for 100 ns and then set it to an unknown logic level 'X' for 100 ns. When we run the simulator we will be able to visually see what the output signal 'B' does when presented with those input 'stimuli' or logic states. *Stimuli - a latin word which is the plural of stimulus, to provide a specific functional reaction! 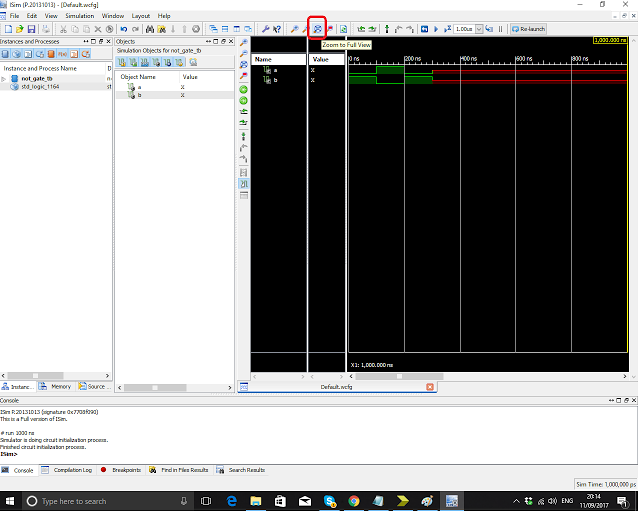 The green part of the traces show how the input 'A' went from a logic '0' to a logic '1' after 100 ns and the output 'B' changed accordingly. 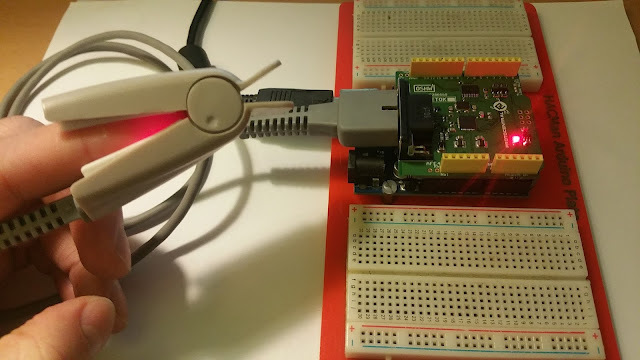 Then the input 'A' went from a logic '1' to a logic '0' for 100 ns and then the input 'A' was set to an unknown logic state 'X' and the output 'B' responded with a logic 'X' for the rest of the simulation - exactly what the test bench code was meant to do. 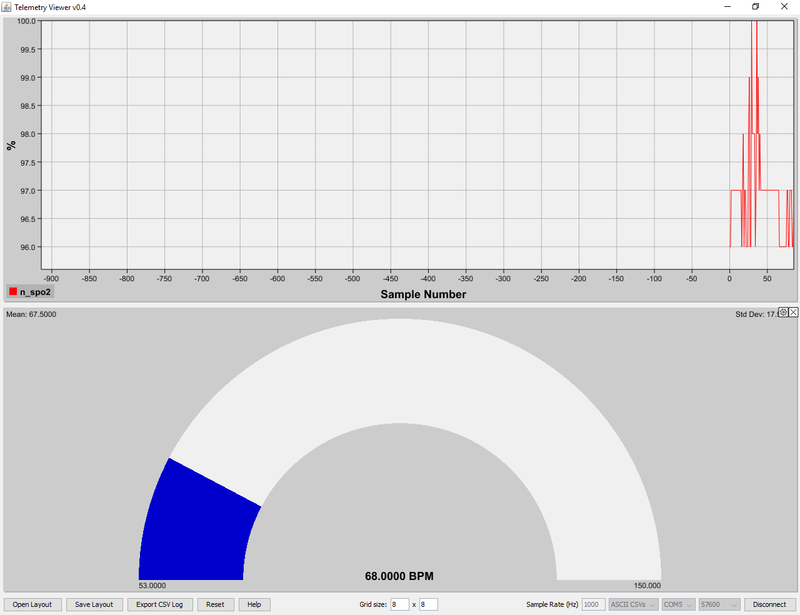 So our simulation worked perfectly and more importantly the Not_gate module works perfectly! This module can now be reused as many times as we like in any of our designs - Most Excellent! 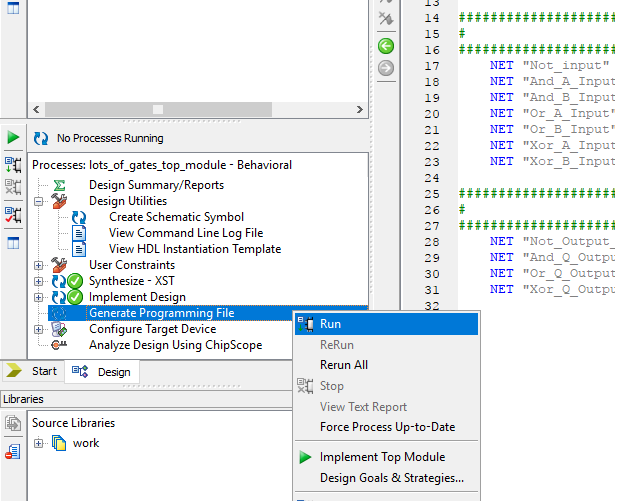 Close down the ISIM application as we are finished with that program to return to the main project screen. 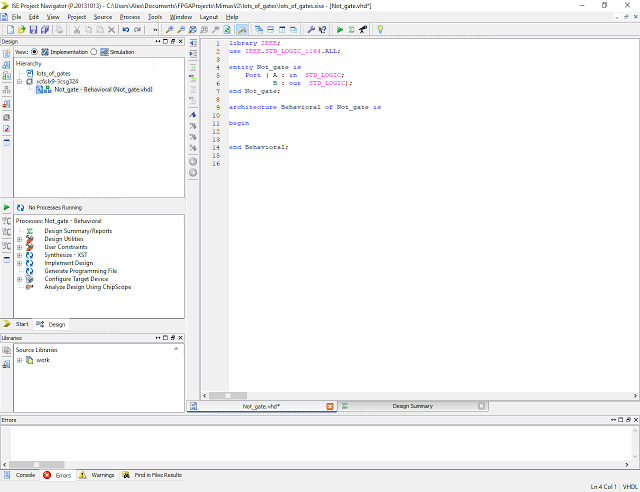 Let’s add some more logic functions like the AND, OR, and XOR functions. I'm not going to show all of the steps with pictures this time though, it's the same process as before. 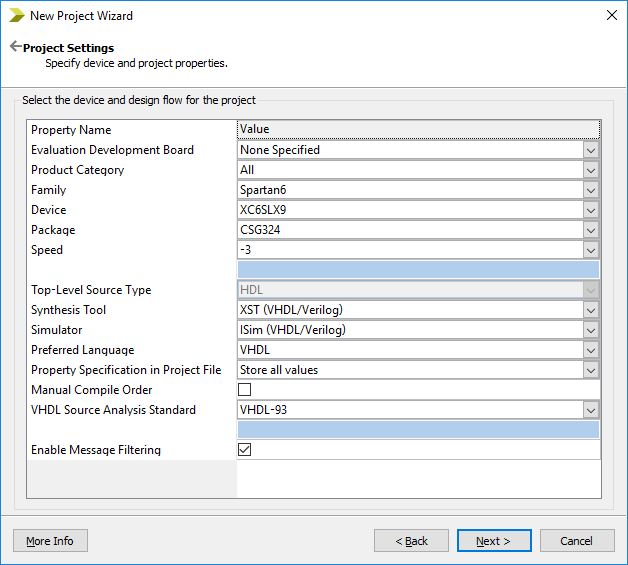 Click on the implementation radio button and then add new VHDL source modules to the project. 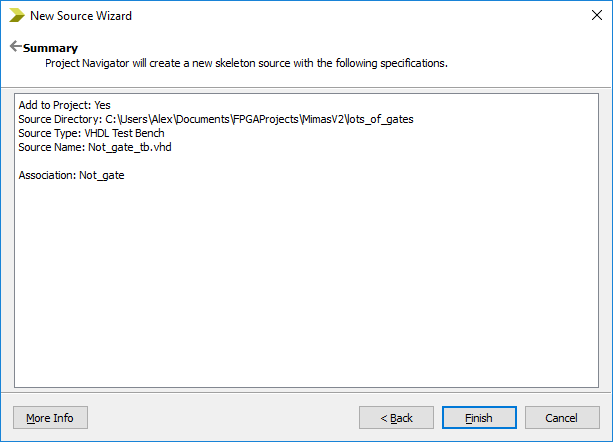 I called mine And_gate, Or_gate and XOR_gate. I chose to make them all two input devices with one output. 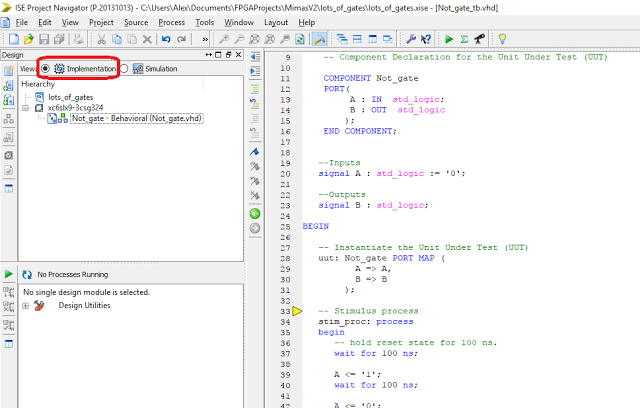 Ensure each VHDL module has the correct code. 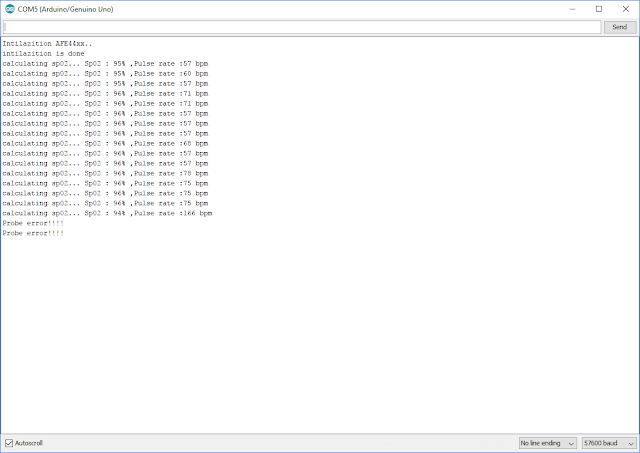 If you were so inclined you could then simulate each module to make certain the code behaves as intended. I'm not going to bother this time but for more complicated modules it's very important that it's simulated. 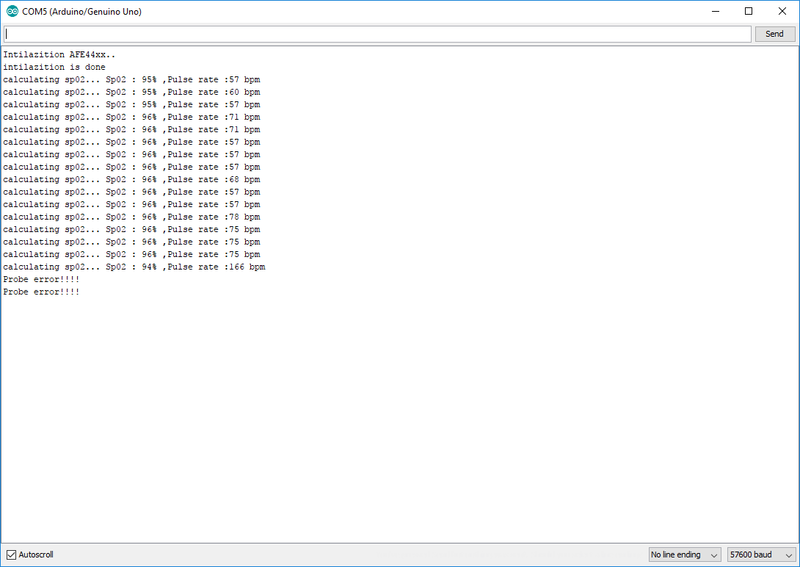 I have saved myself hours of debugging by simulating the module behaviour before continuing. At this point I like to draw a diagram which shows what function I want all of these modules to perform when connected together. 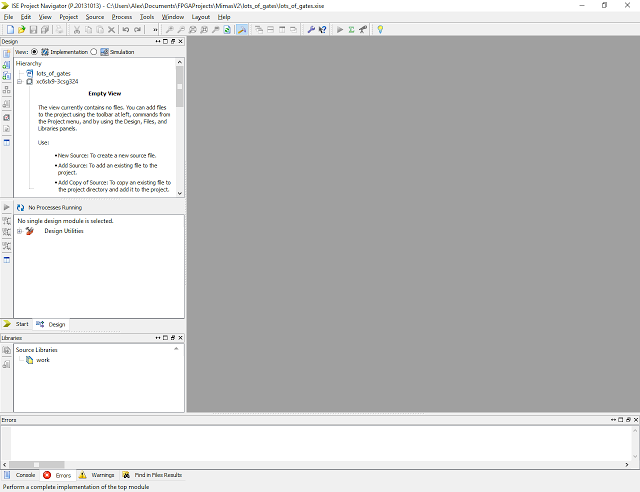 Normally I would do this before I start writing the code but as this is just an example I'm doing it now. Lets implement each logic gate into the FPGA and use the DIP switches to connect to the inputs of the logic gates and then lets connect the outputs of the logic gates to the LEDS so that we can see the results when we change the state of the DIP switches! 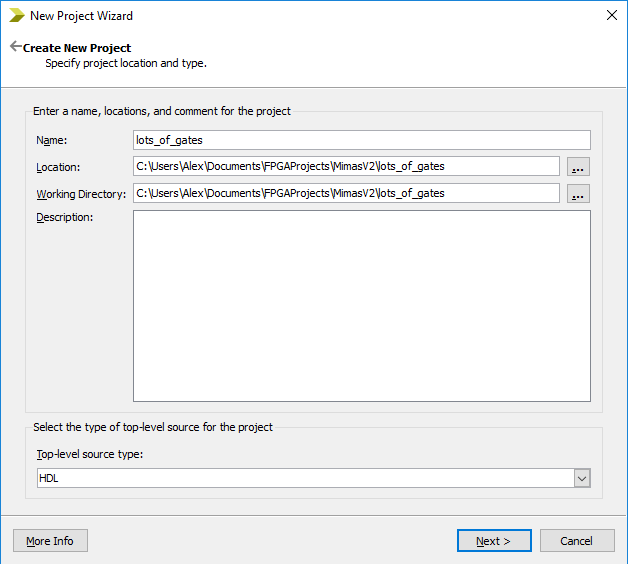 Click Finish to return to the main project screen. The code should be fairly self-explanatory. 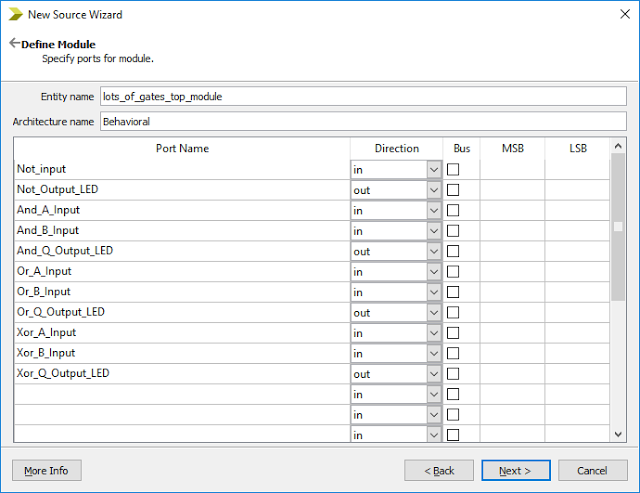 Save the module and now let’s simulate it to make sure it will work as intended. Using the same process as before let’s create a test bench forthe top module and make sure that everything will work. 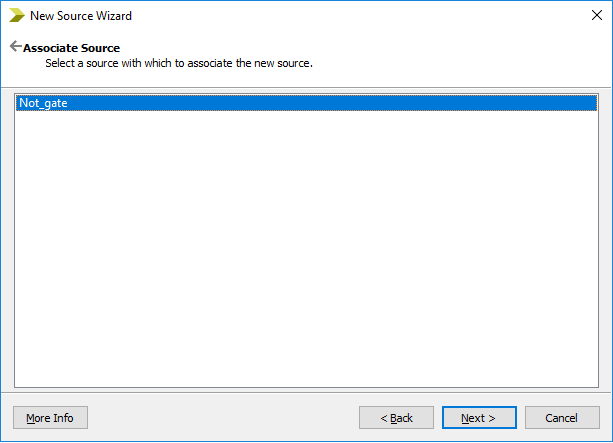 Click on the simulate radio button in the hierarchy window and then add a new source, select VHDL test bench and give it a suitable name. 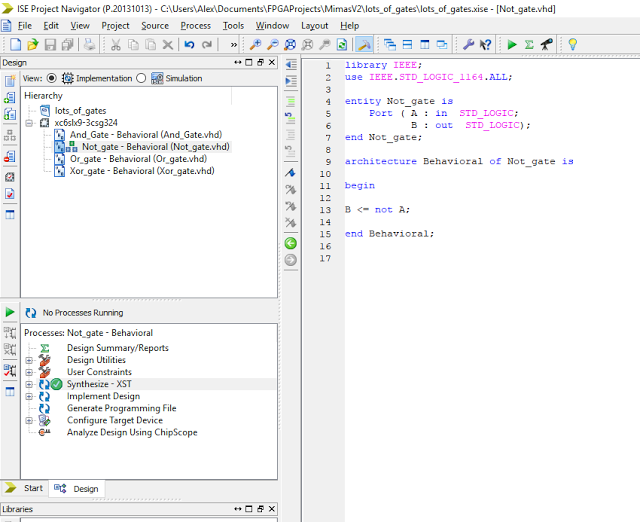 I called mine lots_gates_test_bench. 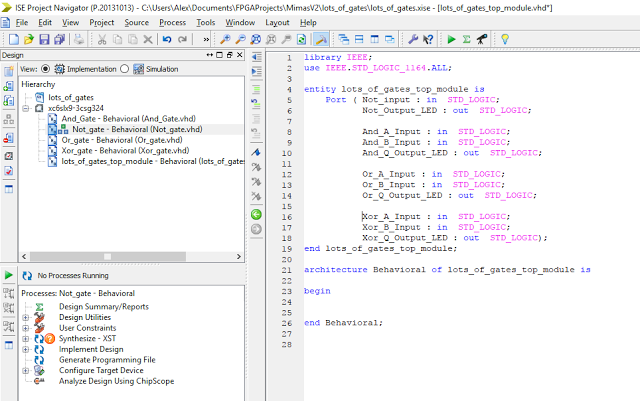 Then associate the module with the lots_of_gates VHDL module and click finish. 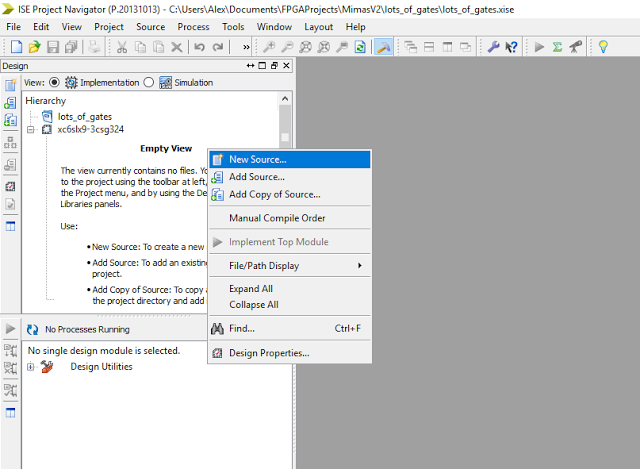 Then WebISE will generate some code for us. Delete the comments as necessary. After that delete the clock sections as we don't need those sections. Finally all that is needed is to write the stimuli section like before. 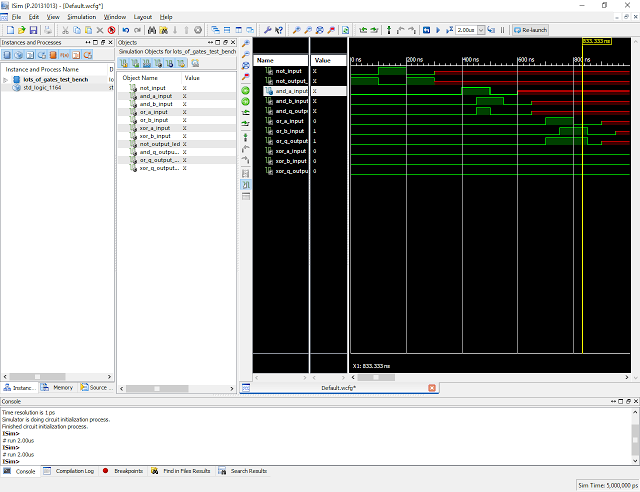 Lets exercise each gate in turn with suitable logic levels and allow time for each state to be easily viewed on the simulator screen. We could exercise all the gates at once but I prefer to see each state separately. Let’s check the syntax and run the simulator! Click Finish to return to the main project screen. 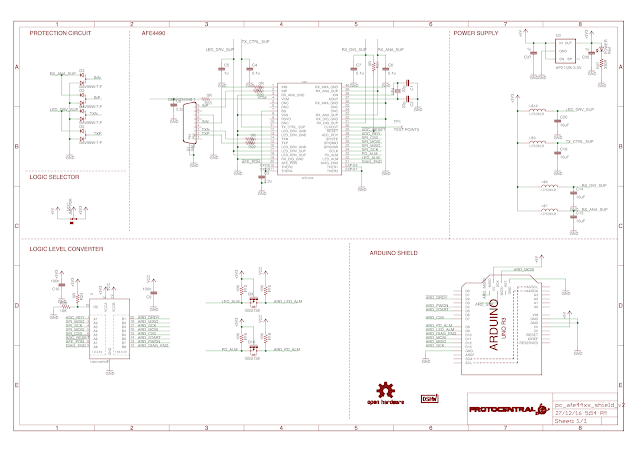 Now we need to decide how we want our DIP switches and LEDS to connect to our inputs and outputs. 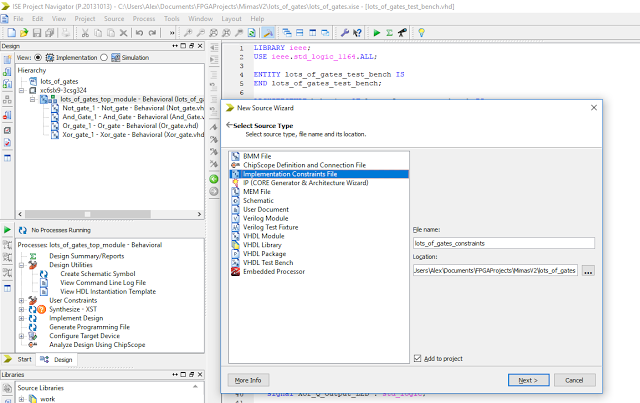 It is possible to use the WebISE software to generate the constraints for us but I prefer to write my own code using the supplied constraints file from Numato Labs as a template. 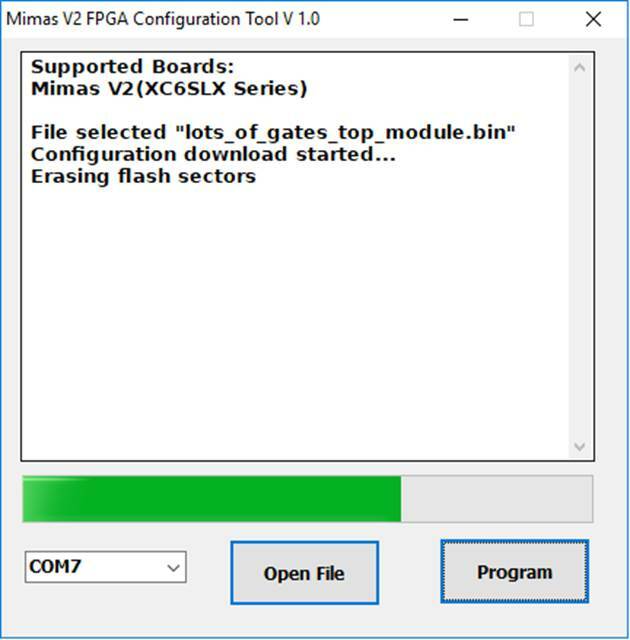 It may take a while...I hear that programming the Mimas V2 using a JTAG programmer is considerably faster! Once that has completed lets test it out! Remember that the Mimas V2 Logic levels are active low. So the LEDS will be off when a logic '1' is present at the output. 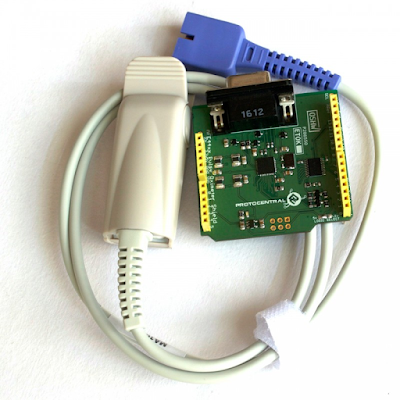 The project uploaded to the Mimas V2 and working! Well that's about it for now...Apologies for the really long post. I couldn't really find a way to make it much shorter. 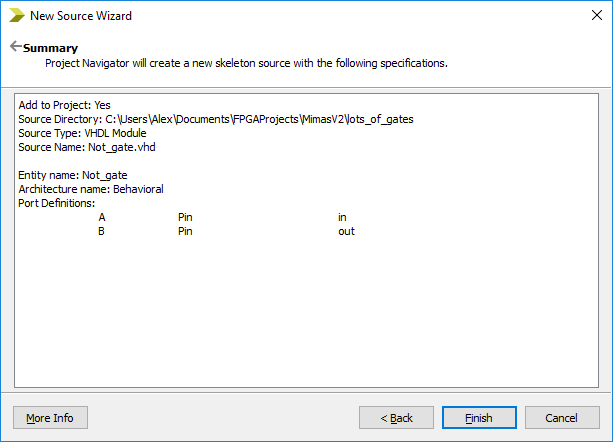 If you want to be adventurous change the code to have multiple NOT gates, or AND gates etc....it only requires changing the instantiation sections with a single component declaration, you will need to map the pins though. That's all for now people - take care, Langster!